Feelings, feelings, feelings! It seems we all have them and we all respond to them in different ways! My girls are polar opposites when it comes to their feelings. Big Pea will typically internalize a bit, but voices her feelings enough to get them out. Lil’ Pea on the other hand…oh my, my, my….when she’s sad she cries…LOUDLY…when she’s mad, she clinches her fists and her teeth and makes some kind of barbaric buffalo noise…then she’s over it completely! I’m happy that they are voicing their feelings in a way that some would balk at, but I wholeheartedly see it as healthy. Its my job to allow them to have their feelings. They are entitled to them. I mean after all, they are “their” feelings! However, as a mom, it is my job to teach them how to properly channel these feelings so that they can operate normally in a social setting. At a very young age, it’s important to open a dialogue between parent and child and children need to feel safe inside that environment so that they will continue to share their feelings. A new toy has been introduced to assist in this process…Kimochis! Kimochis are toys with feelings inside and were created to to assist in parent-child communication and help in building social and emotional intelligence, as well as self-esteem in children. Kimochi means “feeling” in Japanese and the new line of plush characters comes equipped with 3 plush feelings and a how-to-guide. 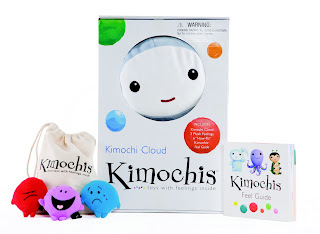 The idea behind Kimochis is that kids can get in touch with their emotions with puppetry and play. Kimochis allow children to communicate with a parent or caregiver in a way that deflects their emotions away from themselves and focuses these feelings on a Kimochi. This allows children to feel more comfortable when sharing their feelings. Each Kimochi comes equipped with 3 plush feelings. One side states the name of the feeling and the other side is a facial expression. The facial expressions allow for children to quickly identify the emotion and place it inside the Kimochi. Additional feeling packs can be purchased separately. The how-to guide gives parents some really great ideas on how to communicate with their child and offers ideas such as games you can play with your Kimochi, so that children can become comfortable with the Kimochi, the feelings and how the process works. This will assist both parent and child later when a “feeling” arises. Each Kimochi has its own and very distinctive personality. One Kimochi may identify more with your child than others. For instance Kimochi Cat loves to be in charge and may be helpful to children who use a bossy tone of voice. 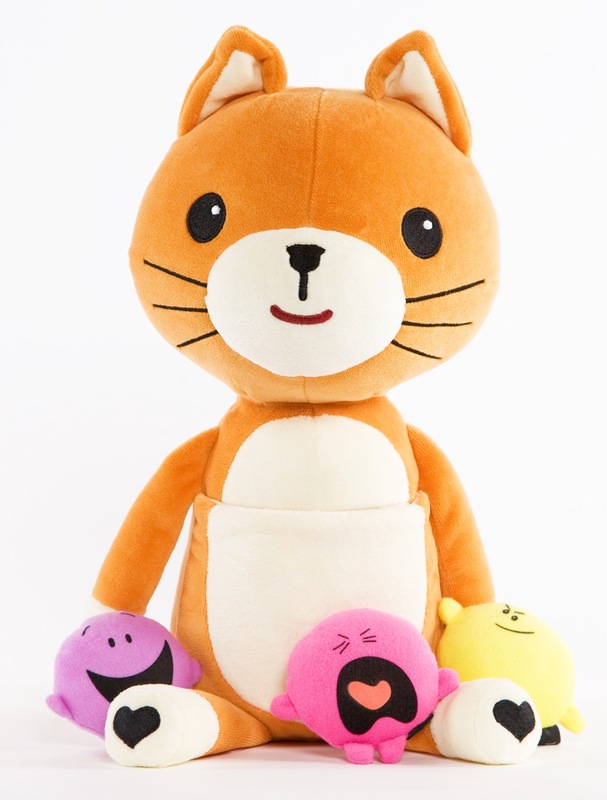 Kimochi Cat comes with Happy, Cranky and Curious feelings to teach your child to ask and not tell others when playing. We received Kimochi Cat and a feeling pack for our review and I very quickly realized I needed to buy another one! Both girls latched on to this little guy and have enjoyed sharing their feelings with mom and dad. It’s actually rather interesting that Big Pea latched on so much to Kimochi Cat because she has never consistently latched on to anything. She carries him around, sleeps with him and she knows how to use him! If she’s feeling something, she goes to the bag of feelings and finds the best feeling that represents her inner most thoughts and she tucks it inside Kimochi Cat’s front pocket. She then brings it to me and let’s me know that she has a feeling and then we talk about it! There’s no long, drawn out drama, just a feeling extended to another, a quick talk and she’s on to the next thing. Kimochi Cat even comes equipped with 5 bandages to heal hurt feelings! Feelings should be as quick and painless as this process. Kimochis allow children to engage their feelings in a way that will make them want to repeat the process over and over again. It’s ok to have feelings and it’s important to share them. Kimochis provide a bridge of communication between parent and child and I know she feels better after we’ve talked played out her feelings. The characters are soft, plush, cuddly, cute and have become a favorite in our home. We have a lot of feelings in our home but they come, they talk and they go! I would highly recommend these to any mom or dad! Now if they could just make one for adults! You can purchase your very own Kimochi character and additional feeling packs at www.kimochis.com. Kimochis retail for $25 and feeling packs with five feelings retail for $12. Each pack of feelings comes equipped with a blank character and a washable pen so that children can make their own feeling. One Lucky “Deal”ectible Mommies reader will win their very own Kimochi (please note that Lovey Dove is not yet available)! 2. visit www.kimochis.com and check out the available Kimochis. Then come back here and leave a comment telling me which Kimochi you would choose AND that you became a fan of Kimochis on Facebook! Win a Kimochi! The Award Winning Toy w/Feelings from @dealectiblemom! 2. *2 Entries* Fan “Deal”ectible Mommies on Facebook! 3. Subscribe to “Deal”ectible Mommies by Email or Subscribe to my feed. The boring stuff: Open to residents of the US only! Giveaway will end on April 10th at Midnight! Winner will be chosen using random.org! Disclaimer: I was provided with a Kimochi for my review. My thoughts and opinions remain my own!